Equine Assisted Psychotherapy (EAP) is an experiential modality which utilizes the power of horses and metaphorical learning to assist in emotional growth and healing. All interactions with the horses are performed on the ground, not on horseback. It is not necessary for individuals to possess horsemanship skills or specific knowledge of horses in order for them to receive substantial benefits from Equine Assisted Psychotherapy. Sessions are facilitated by a Licensed Psychotherapist and a certified Equine Specialist who set up challenges and specific exercises for individuals to negotiate with the horses. The goal of the therapy is not that individuals learn about the horses, but that they learn something about themselves. The act of participating in an activity with the horses in the "here and now", directs participants' attention to their feelings, thoughts and behavior patterns, and helps them to become aware of their responses to certain experiences. Once an issue is identified that has resulted in a dysfunction, the facilitators support the individuals in practicing an intervention for change. The benefits of Equine Facilitated Psychotherapy for adults and children are well established. Interaction with the horses helps people to access their emotional intelligence, define healthy relationships and boundaries, and offers insight into stumbling blocks to healthy functioning. 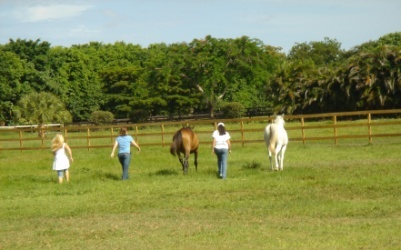 Horse sense is offering programs for individuals and groups to reasonable rates. Treatment centers and other entities are welcome to bring their own professionals.